In two weeks, West Virginia voters will go to the polls and cast their ballots in a special election to determine the next governor. Greyhound protection advocates should consider voting for Republican Bill Maloney. In West Virginia, greyhound racing only exists today because the law requires that two casinos hold dog races in order to conduct other forms of gambling. Greyhound breeders also receive millions of dollars in subsidies annually, funds that would otherwise go to the state. Bill Maloney has rightly said that these subsidies should end. 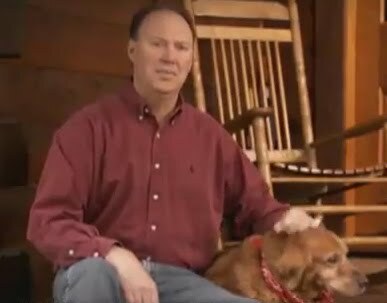 He has also featured his family dog Holly, a golden retriever, in several campaign ads. My favorite ad starring Holly is named Reliable, and compares Holly's reliability to Maloney's vision as governor. "Holly was there with us for every step of the way: From parades to festivals, she enjoyed every minute of the campaign trail ... we would like to thank everyone for their support during this difficult time. Holly was special to all of us and will be greatly missed by people all over West Virginia." By contrast, Maloney's opponent is long-time politician Earl Ray Tomblin. Tomblin's mother and brother are both greyhound breeders and he has staunchly defended greyhound racing, an industry that is cruel and inhumane. The choice is clear. If Tomblin wins, greyhound breeders will continue receiving millions of dollars in subsidies, and dog racing will continue regardless of whether people bet on the races. This means that greyhounds will continue enduring lives of confinement and suffer serious injuries at West Virginia tracks. At Tri-State Racetrack, more than 3,000 greyhound injuries have been reported since 2005. At the state's other dog track, Wheeling Island, more than 700 greyhound injuries were reported between January 2008 and September 2009. On the other hand, if Maloney wins West Virginia will finally have a governor who understands that the state subsidies for greyhound racing should end. Our efforts to protect greyhounds are supported by people from all walks of life and political perspectives. We receive just as much support from conservative Republicans and we do liberal Democrats. For greyhound protection advocates, the choice for West Virginia Governor is clear. Vote for Bill Maloney.